A string of at least nine bombings has rocked the Iraqi capital of Baghdad and two other towns, killing at least 51 people. The violence comes amid a major Muslim holiday celebration. 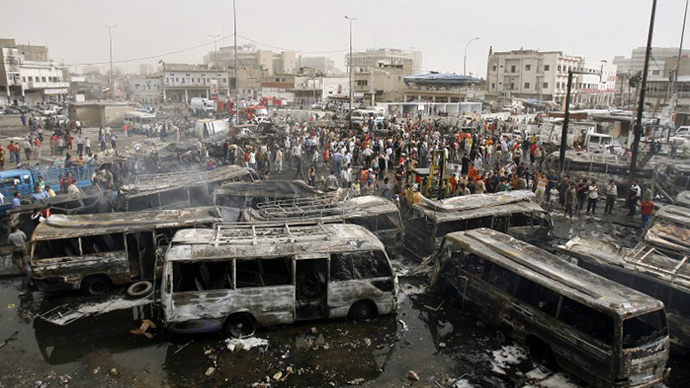 Thursday was the deadliest day in Iraq since October, 5, when a suicide bombing left at least 75 people dead. The bloodshed began early on Thursday after a car bomb exploded among houses in the ethnic minority village of Mwafaqiya in Nineveh province, located some 360 kilometers (225 miles) northwest of Baghdad. "At 6am this morning, a suicide truck bomber detonated himself amid the houses of my village," Reuters quoted Qusay Abbas, a former Shabak representative in the Mosul provincial council, as saying. At least 15 members of the country's Shabak minority were killed and another 52 wounded, according to local police. The village of Muwaffaqiyah is a shelter for many Shabak families who were forced to leave their former homes in the provincial capital of Mosul after being threatened. 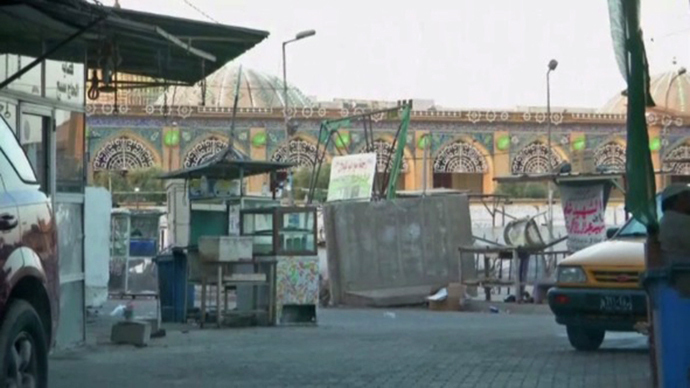 While no one has claimed responsibility for the attack, Sunni Islamist militants have in the past targeted predominantly Shia Shabaks, warning them to leave the area. The UN envoy to Iraq, Nikolay Mladenov, condemned the attack and called for an end to the violence in Nineveh province. “The United Nations pays particular attention to the protection of minority communities who continue suffering from heinous attacks [and] economic and social barriers,” Mladenov said. He has called for urgent action and strengthened security cooperation between the Iraqi government and local Nineveh provincial authorities, as well as within the Kurdish Regional Government. For the country’s 30,000-strong Shabak community, Thursday’s incident is the second massive attack to take place over the past month. In September, a similar suicide bombing targeted a Shabak funeral, killing 26 people and wounding 46 others. The violence then shifted to the northern town of Tuz Khormato, where suicide bombers killed another three people by setting off an explosives belt inside a café. Some 28 people were wounded, police chief Col. Hussein Ali Rasheed said, according to AP. Thursday’s attacks occurred as Iraqis celebrated this week's major Muslim holiday of Eid al-Adha, or the Feast of Sacrifice. 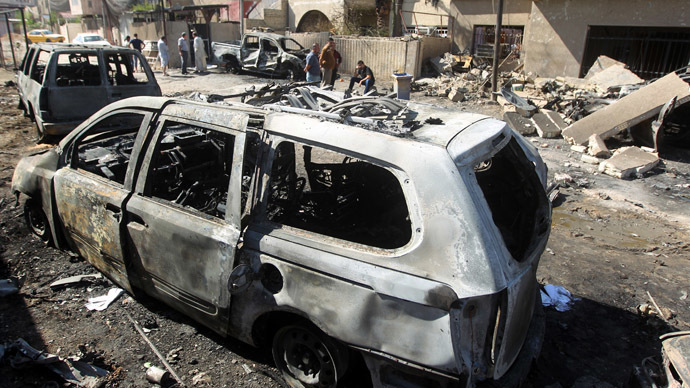 A string of blasts also struck the Iraqi capital of Baghdad and its suburbs. At least seven bomb explosions hit several mainly Shiite locations across the city, killing 33, according to authorities. AP reported that the explosions went off in quick succession and struck families which were heading out to parks, coffee shops, and restaurants for evening celebrations. Eleven people were killed and another 22 wounded when the mainly Shia neighborhood of Husseiniyah was hit by car bombs which exploded about two blocks away from each other. 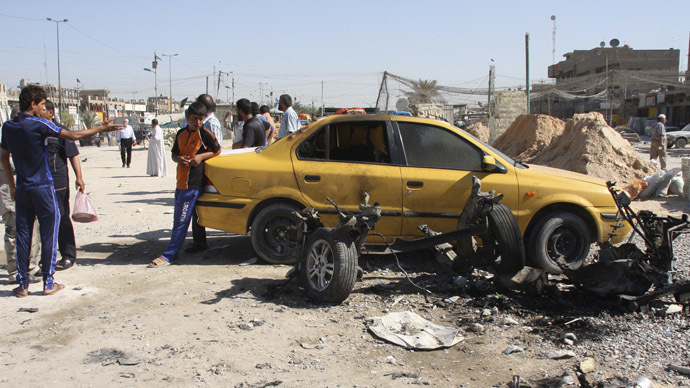 Four people were killed and 12 others were wounded when terrorists hit mainly Shia neighbourhoods in New Baghdad. One of the explosions was reported to have struck an amusement park north of Baghdad's Sadr City neighborhood, killing five children and wounding 16, officials said. Police also reported that a suicide bomber hit a checkpoint in the southern district of Dora, claiming the lives of five people - three of whom were policemen. Nine others were wounded. Another eight people were killed when two car bombs exploded near an outdoor market and shops in the Garage al-Amana neighborhood, where both Shias and Christians reside. Fifteen people were wounded, according to officials. There was no immediate claim of responsibility for Thursday’s blasts. Iraq has recently seen the deadliest outburst of violence to take place in the country since 2008. Nearly 400 people have been killed this month, and over 5,000 have died since the beginning of the year, according to AFP figures.